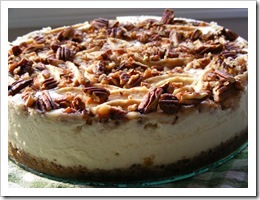 Home » Daring Bakers - Cheesecake! 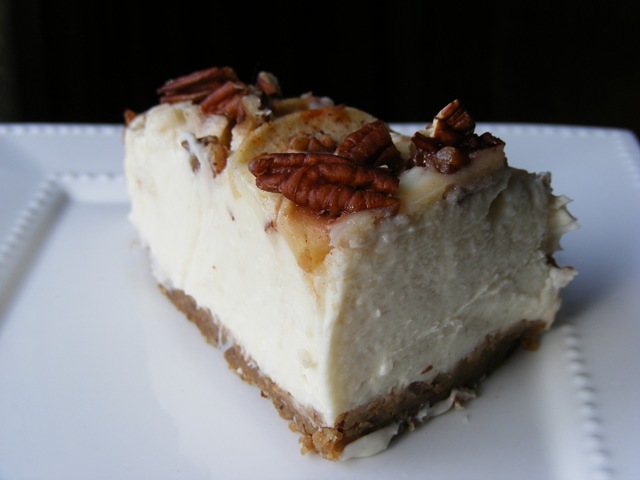 Mmmmm, cheesecake is good (well this one anyway's!). I'm not really a lover of cheesecake so I wasn't overly thrilled when I saw this was the challenge but my husband loves cheesecake so I thought I would give it a whirl. I'd actually never made a cheesecake before! 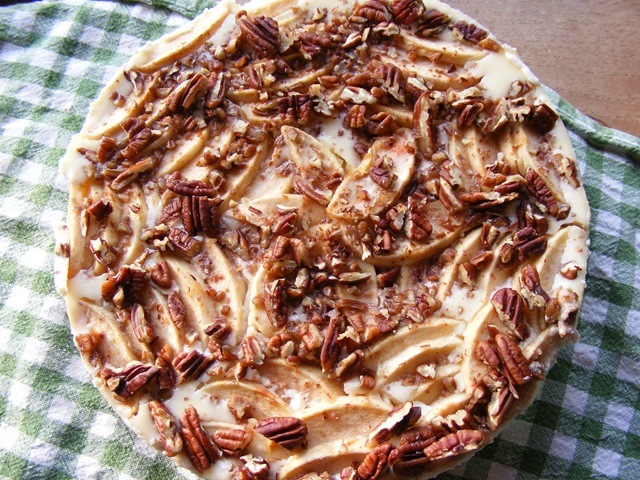 The daring bakers were told to use the basic cheesecake recipe but play with the crust and you could top it however you wanted so I decided to do Autumn Harvest Cheesecake. 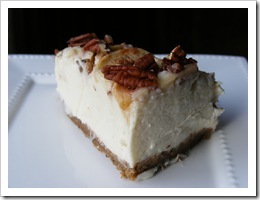 What is Autumn Harvest Cheesecake you ask? 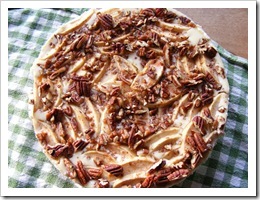 It's a lovely light cheesecake with apples mixed with sugar, cinnamon and pecans on top. 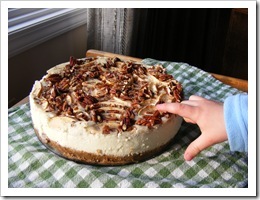 I also threw a few pecans into the crust to break up the graham cracker crust. 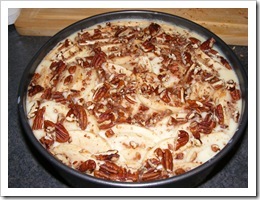 I was thrilled with the final product of this cheesecake. I would definitely make it again! Which, coming from me ( a cheesecake disliker) means a lot! 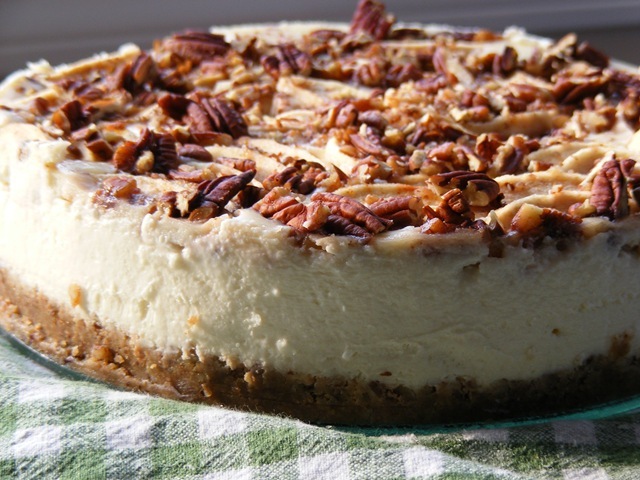 I have also found many recipes that I might alter by using this cheesecake and the other ideas such as a brownie crust and Oreo's crushed on top and a few mixed in, oh my! I won't be doing that right away as I'm back on Weight Watchers trying to lose this baby weight for good. Being a baby baker sure makes it hard to keep the weight off! 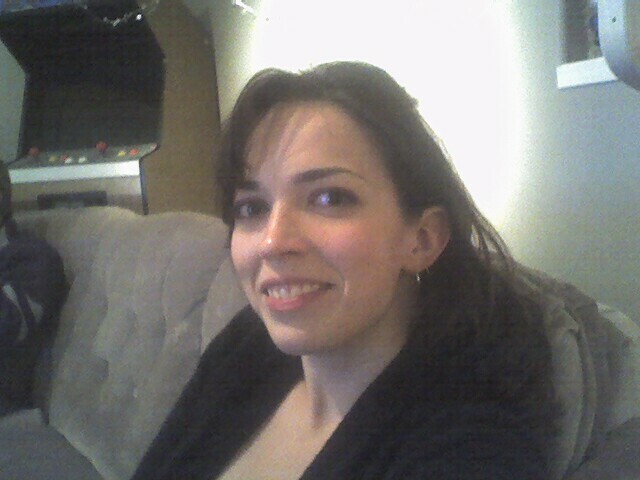 I will one day soon though hopefully be back to looking like I did before I had two little wonderful boys. I wouldn't trade them for anything but my body sure has taken a beating! 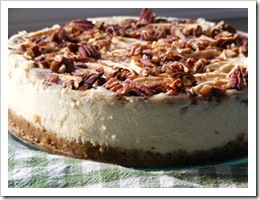 Without further ado here is recipe for this wonderful cheesecake, try it! You'll like it! 3 cups of apples, peeled, cored, and cut into slices. 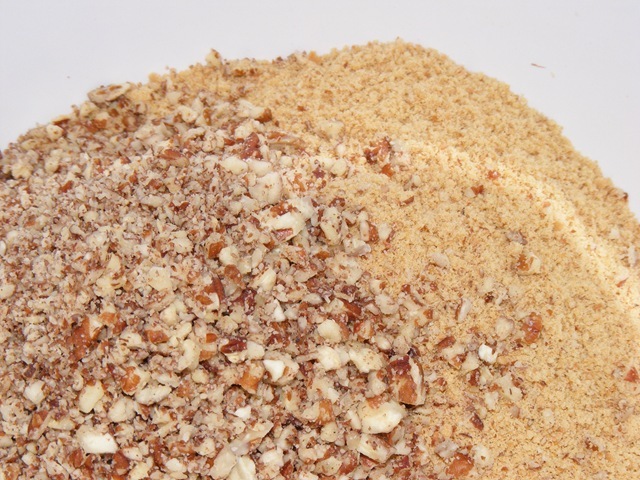 1/2 cup of chopped pecans. 4. Pour batter into prepared crust and tap the pan on the counter a few times to bring all air bubbles to the surface. (If your making it like I did put the topping on now otherwise just keep following the instructions). 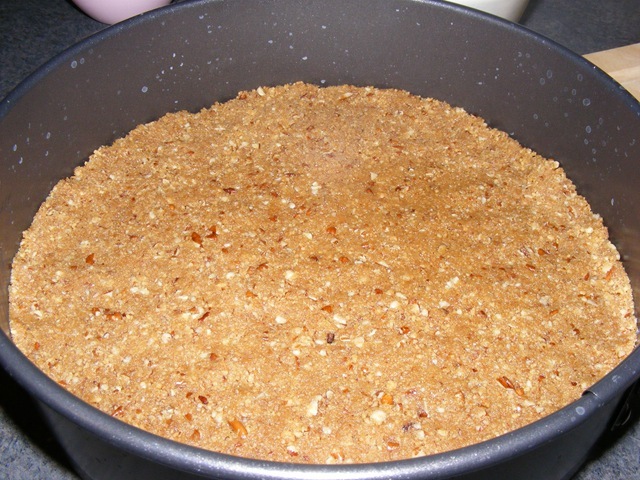 Place pan into a larger pan and pour boiling water into the larger pan until halfway up the side of the cheesecake pan. If cheesecake pan is not airtight, cover bottom securely with foil before adding water. P.S. Come back on the May 14, 2009 and see what the Daring Cooks have up their sleeves!!! 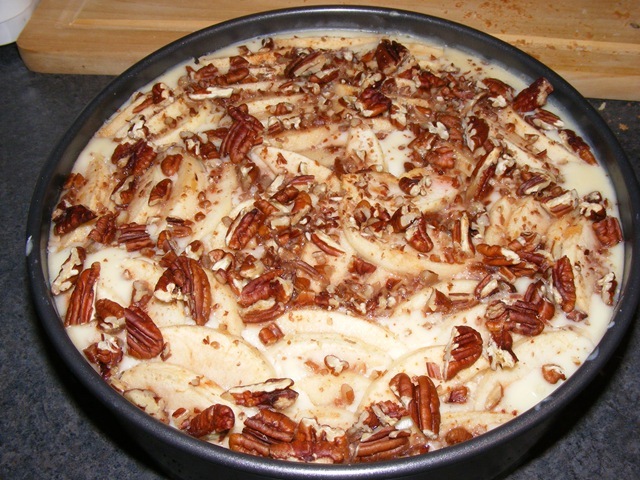 Your cheesecake turned out amazing. Great job with this month's challenge! YUM!! 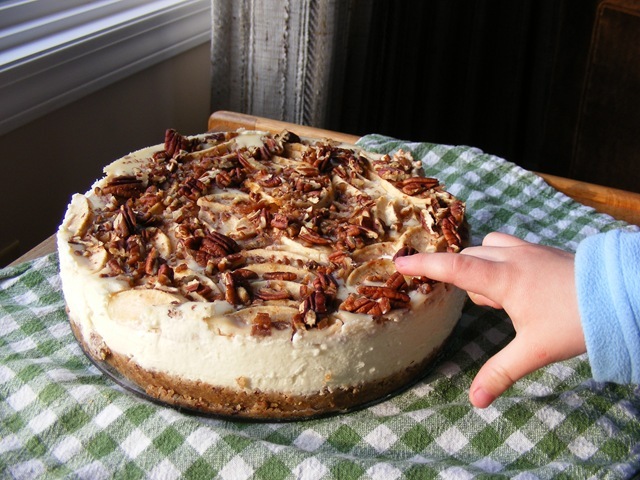 That's a tasty looking cheesecake! Looks lovely! Great twist and love the fingers getting a sample. Sounds great! 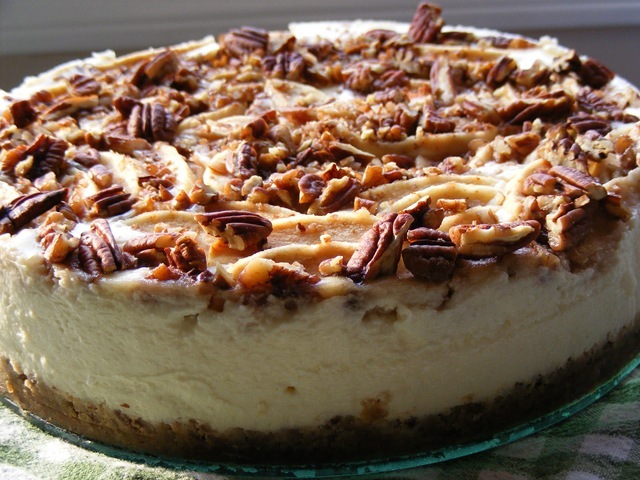 This is my kind of cheesecake...I just love autumn flavors. Love your cheesecake. Glad you enjoyed it even though you dont really enjoy cheesecake. Thanks your you visit to my blog! Lovely! 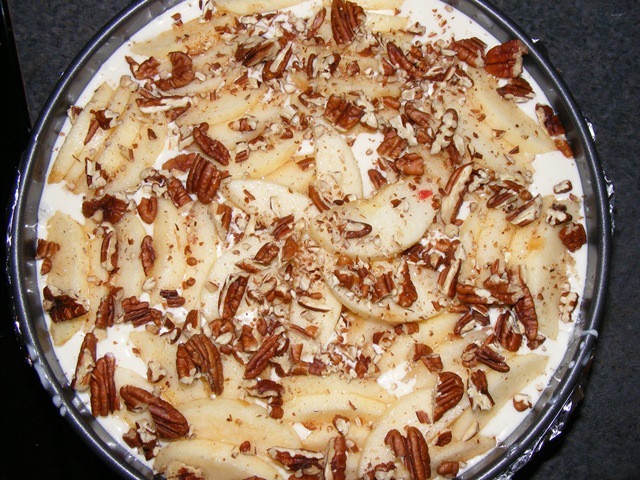 I love apples in my cheesecake any day! I'm glad you enjoyed it even though you didn't think you liked cheesecake. I saw a lot of vegan versions during this challenge which are quite a bit more healthful if you felt like digging around the blogroll. Sorry I'm late in getting to your post, I'm trying to make it to every one of the 1k+ Daring Bakers! Glad you were a part of this challenge!